G, BSP, BSPP thread nickel plated brass push to connect fitting female branch tee is used to connect two tubes to a male G, BSP, BSPP threaded connection at 90-degree angles from the middle of the tee. The body of nickel plated brass push to connect fitting female branch tee with female G, BSP, BSPP threaded connections can be rotated after installation to allow for variations in tube direction. Nickel plated brass push to connect fitting female branch tee offers the robustness, reliability and resistance to industrial fluids for the most demanding environments. Nickel plated brass fitting female branch tee is used in pneumatic applications like robotics, conveyor systems and any system requiring the transfer of compressed air or some liquids compatible with the materials of manufacturing. Female branch tee nickel plated brass push in fittings are available in both inch and metric sizes, and can be used with a variety of tubing materials, compatible with polyethylene, polyurethane, FEP & nylon tubing, the flexible tubing is easily connected by simply inserting the tubing end into the fitting. To release the tubing, press the circular release ring and the tubing can be easily pulled out. 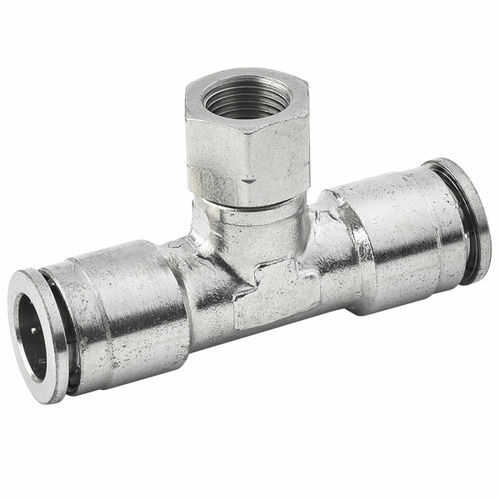 Female branch tee nickel plated brass pneumatic fittings have hexagonal thread allowing tightening with wrench. Accommodate metric tubing O.D ranging from 4 mm to 16 mm and inch tubing O.D 1/8" to 1/2". Thread sizes range is from BSPP, BSP, G 1/8" to BSPP, BSP, G 1/2".